Last day today, we packed up camp (which we are now getting pretty good at) and started the final leg of the drive to home. The weather was overcast and cool and the last 700 km slowly ticked away as we slowly got used to having traffic around us again. Not much to report for today – Lunch at MacDonald’s at Horsham and after a total of 8549km we pulled up at home about 6:30. Everyone was pretty tired but had a great time. Today we woke up and it was raining so we had to pack up everything in the rain. It was really cold and not much fun. On the way to Port Augusta we passed a solar powered car – it was still raining – Katherine said “it’s not going to go very fast in this weather!”. We arrived at Port Augusta and walked around the shops for a while then we had some morning tea and continued driving. We stopped at Port Wakefield to get some fuel and kept on going. About 3pm we arrived in Handorf and got a hotdog and a milkshake for lunch we wandered the shops for a while a bought some lollies and some Beerenberg sauces. Today we start heading towards home, the delays earlier in Alice mean we will not get to Dalhousie this trip and from all reports the only way now to get a decent view of the water in Lake Eyre is to fly, so I guess we will just have to come back again some time. The plan was to head south and stay the night at Coober Pedy, but as we got close to the SA border the weather was starting to turn and for quite some time we drove just outside of what looked like a pretty nasty dust storm. We stopped at Coober Pedy and within 15 Minutes the storm had arrived, the whole area was choked in dust and we quickly decided it was best to push on. We ended up traveling all the way down to Woomera where the weather was far more pleasant and set up camp for the night. Over night the weather caught up – and while we had no dust storm, we had very strong winds, rain, thunder and lightning and for the first time in several weeks we were all pretty cold. Looks like the holiday was nearly over. The warning signs in the camp ground about Dingoes were certainly true! We had been there less than an hour before we saw our first dingo sneaking around people’s campsites looking for an easy feed. It didn’t take long before it stole a container of ham from one camper and we saw this repeated several times in the short time we were there. They seemed to have no fear of people and come into the camp ground any time of day. We drove out toward the Canyon but stopped at the medical centre where I got my stitches out. When we arrived at the canyon we decided to do the 6km rim walk. This started with a very hard climb, going up over 100 metres. The younger fitter generation managed this a bit faster than Mum and Dad. Again like the walk through Kata Tjuta it was very scenic and well worth the climb at the start. There were several spectacular lookouts. We had lunch at Kathleen springs and did another shorter walk to the waterhole at the head of the Kathleen gorge. Today we visited Kata Tjuta (The Olgas ) before driving up to Kings Canyon. At Kata Tjuta did the “Valley Of The Winds” walk – it wasn’t that windy but it was very scenic . It was a 7.4 km loop though the domes to 2 separate lookouts which were amazing, the walk took us about 2 ½ hrs. Some of the parts were quite difficult – as the sign said. We took loads of photos. After that we drove to Kings Canyon. But I can’t say much about that because I was asleep <(-_-)>! Today we visited Uluru (Ayres Rock ), first we went to the cultural centre where we learned about some about the local aboriginals and the wildlife of the area. We also found out about a ranger guided walk called the Mala walk – which we decided to do. The walk was very informative and we learnt about the dreamtime stories of Uluru – the Pitjanjatjara people call these Tjukurpa (chook-a-pa). 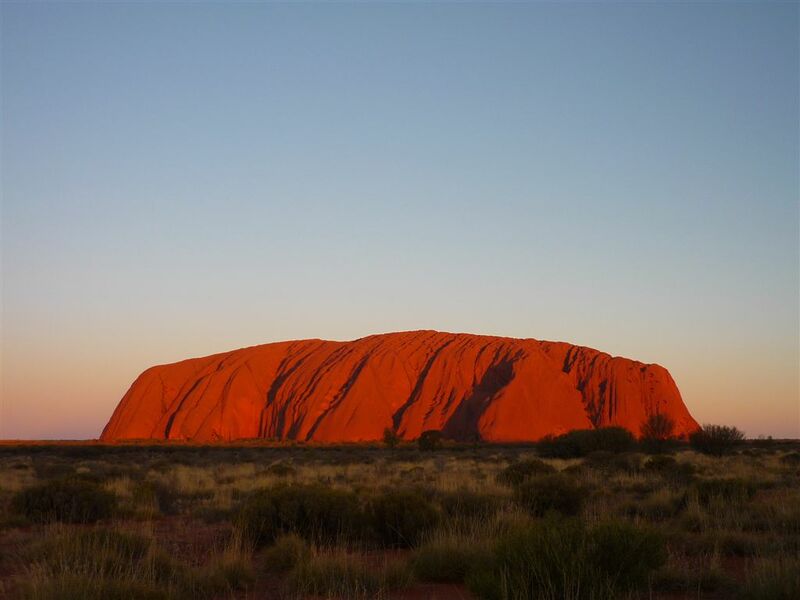 The local aboriginals ask people not to climb Uluru because the climb can be dangerous and over 35 people have died attempting the climb and the local aboriginals say they feel great sadness when someone is hurt or dies on their home land. 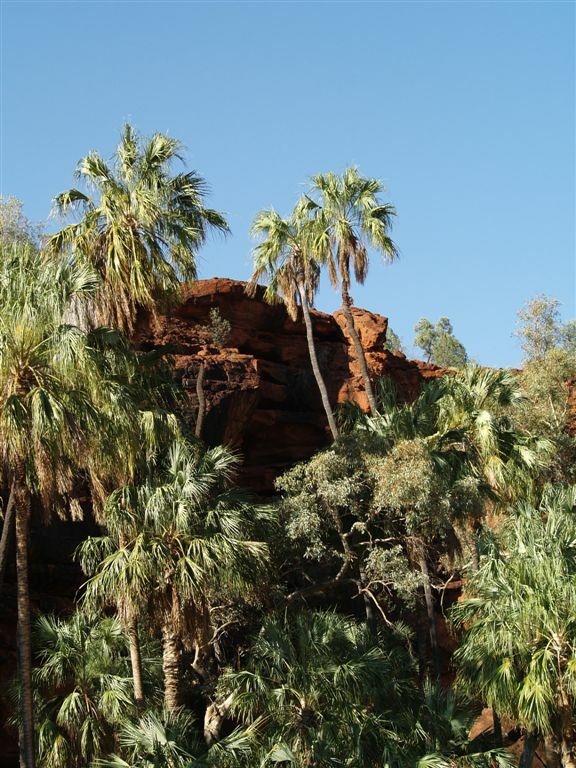 They much prefer people to walk around the rock and learn more about their Tjukurpa stories – they say that there is no tjukurpa on top of Uluru, otherwise we would encourage climbing. We continued to walk around the rest of the rock, seeing many amazing rock formations. On the way around we also visited the Mutitjulu water hole which is very important because it is the only permanent water in the Uluru area. Today we had a long drive, because of the delays in Alice Springs we have to go all the way down to Uluru in one day. The roads out of palm valley are pretty bumpy – and somewhere along it we lost our UHF antenna tip. Once we got back to the main road it wasn’t much flatter, as the first 250km or so was pretty corrugated dirt. We had a pretty good wildlife day today; we saw a herd of wild camels , some wild donkeys and lots of wild horses as well as finally seeing our first dingo. Once we got past Kings Canyon the road turned back to tarmac and the last 300km didn’t take too long to pass. As we got closer to Uluru we saw Mt Connor – lots of people get fooled that this is Uluru, but we all knew it was there. We finally saw Uluru – it was huge. We set up our campsite at the Ayes Rock resort and went out to watch the sunset over Uluru. We could also see Kata Tjuta (The Olgas) in the distance. We all took heaps of photos as the rock changed color as the sun went down. Today we finally packed up our camp and headed out of Alice Springs. First we visited Simpson’s Gap on the way to the aboriginal community of Hermannsburg , This is the site of the first mission set up in Central Australia (1877) and home town of the famous aboriginal painter, Albert Namajira. We took a look around seeing how people lived back then, before we headed out to Palm Valley where we camped the night. At Palm Valley we went for a walk along the valley ridge then down into the gorge where we saw hundreds of the rare Red Cabbage Palms that are only found in this area. Only 1500 of these palms exist in the world and they are all in this valley. That night we heard one of the rangers give a talk about the park and what rangers do in NT national parks. During her talk I found a blind snake while digging in the dirt. She told me afterwards that these blind snakes are pretty rare and we were very lucky to see one. Day 8, we left Boulia at 7:30 am heading west along the Donohue Highway. Today was going to be one of our longest drives. Alice Springs is 806km away and there is not very much in between. The first exciting thing we came to was the border of the Northern Territory and Queensland after 3 hours of driving. I have never been to NT so it was pretty exciting. Dad is getting pretty quick at changing them now – but once again we had no spare – and we were still 400km away from any town. We got fuel at Jervois and continued on carefully. We stopped at Atitjere Aboriginal Community – where I got a Golden Gaytime and a Coke. We finally got to some tarmac and drove the last 160Km into Alice Springs after 10 ½ hours driving. Just out of Alice Springs we made 1 final stop, there is a marker on the side of the road showing where the line is for the Tropic of Capricorn. Once we got to the Caravan Park we are staying in at Alice – we set up the tent and got to watch a show put on by a guy singing Australian bush songs. He played the guitar, a harmonica and sang, he was very good at all three. Day 7, we got up early and packed up the trailer. Then we went to the bakery to get some bread, before we headed out to the edge of the Simpson Desert to see “Big Red”. This is one of the biggest Sand dunes in the desert. We drove up to the top where I got out so I could take photos as dad drove down and then back over again. After a good look at the desert, we drove back into Birdsville where we picked up the trailer and went back to the hotel where I bought some souvenirs. Then we headed north towards Bedourie, on the way we saw a shoe tree!! This was a road sign that people had hung lots of different types of shoes on. They do some very strange things out here! We saw some ruins of another homestead along the way and some Waddi trees, these are very old trees from the time of the dinosaurs. The explorer Wills had some seeds from these in his diary when he was found. We camped on the banks of the Burke River in Boulia.